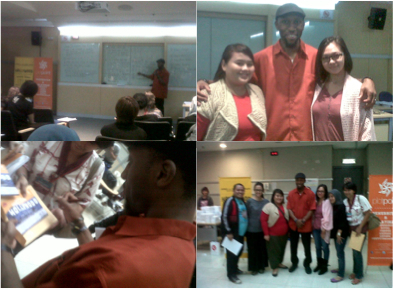 As the participants who work for a television, I brought my Indonesian TV Series knowledge to this workshop. And of course, the 1st curiosity will be: CSI: NY is a program that needs to be analyzed, and only smart audience has time to analyze thing. It’s so different from Indonesian sinetron genre, that only need to be watched, and enjoyed emotionally. I thought (and probably about half of the class also), US audiences must be very smart. However, his explanation for me was a bit of surprise. The US audiences like three kinds of story (which represent by three kinds of character); Cops, Docs and Lawyers. “After gets home from a tiring whole day of work, they like to watch people gets justice, the good character always win, it’s entertaining. They don’t need to watch heavy material such as politics, race, religion.” He also explained that the audiences mostly are mothers of five children who try to put their children in to bed. So (he hates to say it, but) that’s why they make visual for a scene to make clear of the audience, even if they don’t hear the dialogue, but they will understand as they watch it while they put their children in to bed. This situation basically is not far from Indonesian audience. Our audiences mostly are mothers, housekeepers, or women who do many things at one time, that they don’t have time to actually watch the TV. But the unique thing is they keep their TV on, and expect they still can listen the audio of the program and understand the whole story without leaving off whatever they do at that time. So, that’s why our audiences (I hate to say it, but) are listening to TV, not really watching it. One other thing why character driven plot is popular in Indonesia, it’s also referred to most audiences who are mothers, housekeepers and women. Their daily life preppy do the same thing, stay at home and taking care of her family. Basically they don’t have much entertain. That’s why character drive plot is suitable for them. Emotionally they will be entertained as audiences follow the characters. Those different behaviors of audiences make different treatment of how a TV Series writer writes his script. Either way, we can’t blame the audience for their level of ability to analyze and actually to understand a program. Now, my 2nd curiosity: Indonesian televisions use AGB Nielsen to rate their TV programs. Basically, it’s the one that drive a TV to survive in the industry. If the rating of a program is high, then the request of advertisement will be high as well. Remember, advertisements are the ones that make a TV continue to air. How do they call it ‘soap opera’ in the first place? Basically a soap company wanted to announce their product. It won’t be interesting if people only listen to the product advertisement. So, they make a program to attract listener of the radio, by creating an opera that break into several parts to announce the soap product. Back to Nielsen rating, it’s “the thing” afraid by Indonesian broadcaster. Our TV can be very cruel in airing their program. If it doesn’t work (low rated) after one week stripping, it can be cut in the middle of the program without any closing episode. Puff! Just like that, and a TV series’ gone. But, if the demand is high (high rated), then it can be shown for years, stripped every single day up to –not one, not two, but– four hours per airing. Doesn’t make any sense? Well, let me tell you something, the story is getting not make any sense either, but their rating is high and that’s all matter. I’ve been working on some TV Serials; character driven show, of course. In the beginning we made general plot of the whole season. But in the middle, by request of the audience, the story can change. The ending can change also, for the sake of rating. It’s as crazy as that. Unhealthy and “not smart”? Well, it’s the condition of audience behavior we have to face in Indonesia. In US, the condition is a little bit different from what I catch based on Mr. Thomas’ explanation. They have rating for each TV program, but in the beginning of the show they have number of target viewer. CSI: NY is target for 20,000,000 audiences. While Dexter is target for 2,000,000 audiences. The two numbers is very different, but the target number is made based on the content of the story and where the TV series will be airing; is it on regular TV? Or pay cable? Dexter with smaller number of target audience is airing on pay cable. The conflict on the show is also heavier than CSI: NY. I assume, if the target audience is fill, then the TV series will be continued to the next season. Each season used to be 13 episodes. However, now they make it as many as 22 episodes. If the show didn’t work, then they will end the series and call it as final season. I just wish our TVs would make a wise decision before ending up a TV Series. If they don’t want to give the rest episodes as final season, then -for the sake of responsibility to the audience- at least give one episode to make an ending. For me, if this happen, then our TV Series’ still the ugly sister we don’t want anyone to meet. Salam kenal, Mbak Ratih. Boleh minta alamat email? Aku mau tanya2 ttg penulisan skenario (khususnya skenario serial TV).